#13 Thick 'Vibrant Color' Tubing with Gold Tube Lock installed. An exclusive Microsonic design, the Tube-Lock coupling system is an excellent way to attach tubing to soft earmolds. 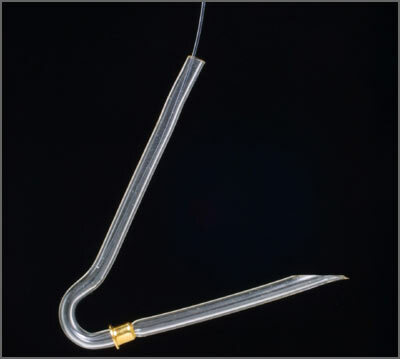 When inserted into a soft earmold, a tiny flanged ring on the quilled tubing fastens into the material foaming a securer seal, eliminating the need for cementing. Ideal for vinyl, silicone and soft silicone earmolds. For easy installation, use the Tube-Lock Applicator Tool. #13 Thick 'Vibrant Color' Tubes with MicroLok® installed. #13 Thick 'Vibrant Color' Tubing with Silver Tube Lock installed. The Thick 'Vibrant Color' Tube Lock Plus is a coupling system with patented, pressure-fit retaining flanges designed to work with soft earmolds.